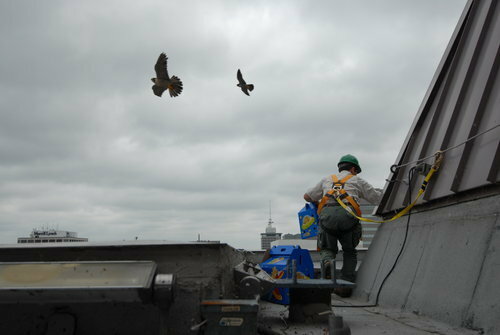 DGIF biologists accessed the ledge at Riverfront Plaza this morning and banded all three of the chicks from the nest. The chicks were easily gathered up and brought in from the ledge. As expected the adults were very defensive keeping the biologists on their toes. The three chicks were healthy and by all indications doing well. Measurements taken during the banding confirmed our suspicion that there were two males and one female here. 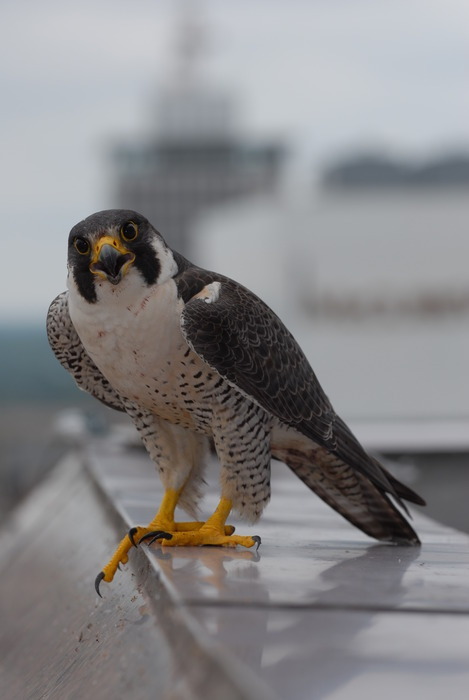 The female was already nearly a third larger then her male siblings (tiercel is a falconer’s term for a male falcon and is from the old French word for third). The birds were fitted with both an anodized green aluminium USGS band and a black over green auxiliary band. The colors of the auxiliary band indicate that the birds were banded in the Eastern U.S. While the birds were being banded and measured – additional DGIF staff constructed the pen which will be used to ensure that the young do not fledge prematurely, something that has occurred at this site previously. The pen allows the parents to continue to feed the young and allows them ample room to stretch their wings. Following the banding the young were all returned to the pen.